Option 1: Full Service Bottle Billboards! Option 2: Post your own Bills!! With either option there is a minimum order of 1 case. 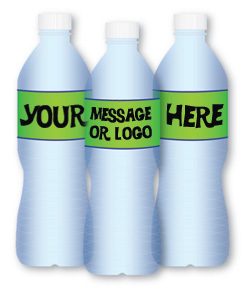 All Bottle Billboards are printed on waterproof polyester and are fully adhesive. They can be submerged in ice water without damage. The price includes design of your unique label in full color with bleed. A discount will be considered for charitable events or large orders over 10 cases. Save the shipping expense and order your CUSTOM WATER BOTTLES from us locally!